Have you ever felt utter frustration for something that can’t be changed? Even worse, having to endure it for many times over. Getting visas for China is one of those frustrating tasks that I loath but must do. The visa application centre used to be part of the Chinese Consulate in Toorak but in recent years changed to a privately owned company in St Kilda. The wait in line became twice as long and the application prices were almost twice as much. Nevertheless, if you want to go to China, you must apply for one. My most recent dilemma was when I dropped off my friend’s passport along with mine and as she had never been to China before, they asked for her birth certificate which I didn’t know was needed. So, I had to go to the visa application centre 3 times during one week and had to wait 2 hours at both drop-offs and about half an hour for the pickup. It’s a sad life it is! I almost forgot the moral of the story. 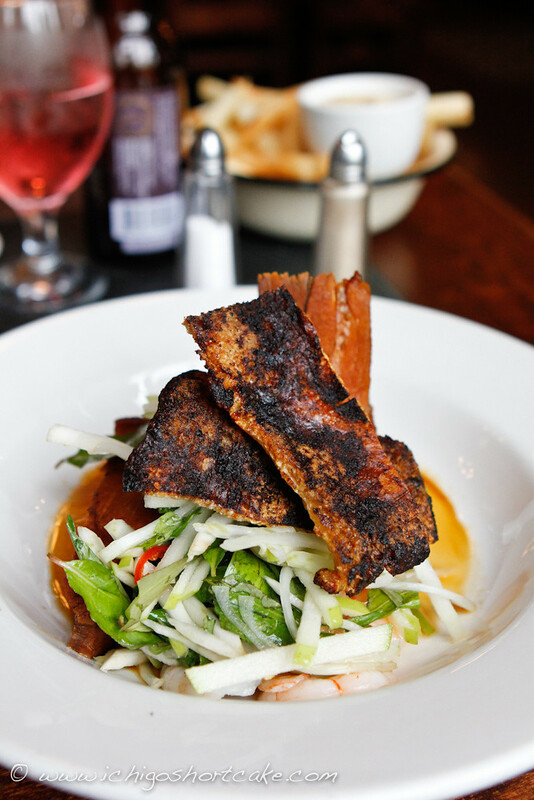 If you also find yourself stuck in the visa dilemma, fear not because you can take out your anger and frustrations by having a hearty meal and/or a drink or two at the Belgian Beer Cafe Bluestone just across the road from the Visa Application Centre. It was the only thing I looked forward to and we ate there twice in that one week. 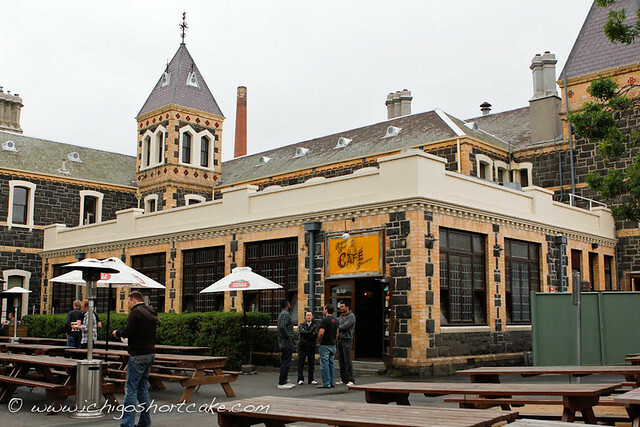 It’s a nice beer drinking environment with seating both inside and outside. They have a good collection of spirits, wines and flavoured beers for you to choose from if the regular beers don’t take your fancy as well as different menus for beer food and proper meals. However I was told only beer food and drinks are allowed to be consumed outside. We went to the Belgian Beer Cafe the first time I dropped off the passports when it was already 3pm. Lucky it doesn’t close in the afternoon like some restaurants do. We started off the meal with beer of course. Well, to be specific, Yuye had beer. It was a Cheeky Rascal Raspberry & Apple Cider for $9.50 by Rebello Wines, which is a branch of the famous Sunny Ridge strawberry farm in Mornington Peninsula. A few friends and I are actually planning a strawberry and cherry picking day there tomorrow so I will be writing about our adventures some time later. 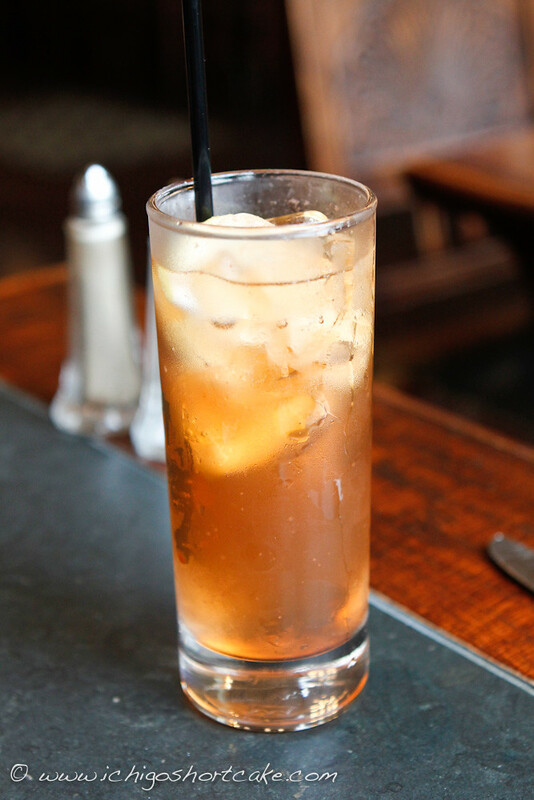 It was a refreshing and sweet drink that tasted like summer, a perfect start to our long awaited meal and soothed our worn souls quite well. I was going to drive home and since I was so tired already, I didn’t want to drink anything alcoholic. What do I choose when I don’t want alcohol? Lemon lime and bitters of course ($3.50). There was quite a lot of bitters and syrup in the drink but was still thirst quenching enough to keep me happy. 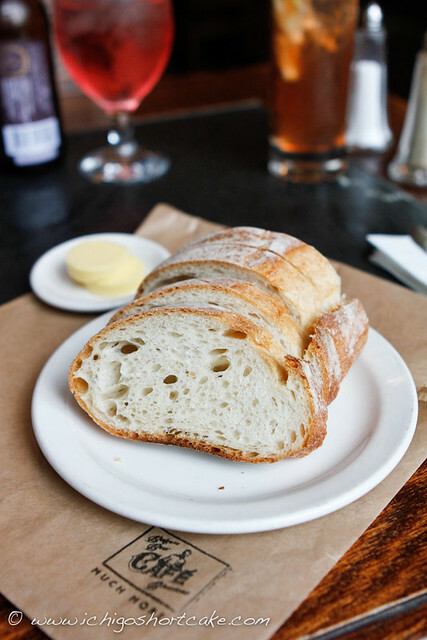 Complimentary bread and butter were served and interestingly enough they’re served in paper bags. I love surprises so when I see a bag full of things, I will always smile even if I know what the content is. The bread was fresh and yummy, but I find I always stuff myself with too much bread at the beginning and can’t finish my actual meal. 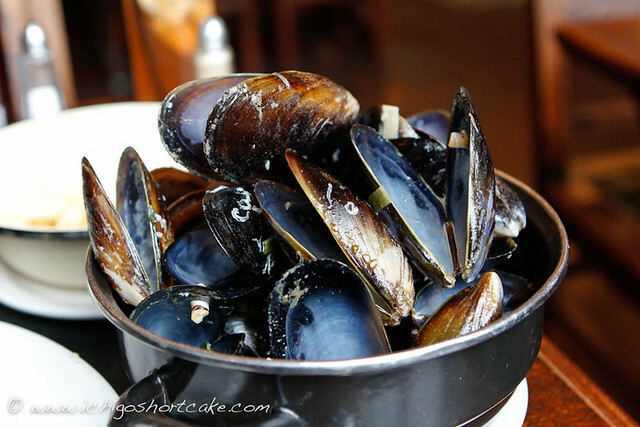 A lot of people go to the Belgian Beer Cafe just to eat their mussel pots and drink the beer. It’s weird but it seems that the Belgian Beer Cafe had in fact cured my previous dislike for mussels as Yuye loves them and orders a pot every time he eats there. This time was no different. 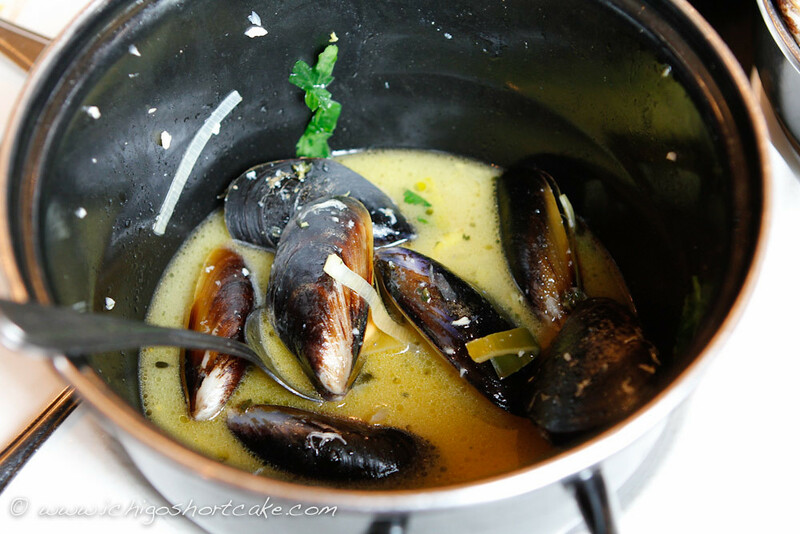 He ordered his favourite Mariniere pot which is mussels cooked in white wine, celery, onion, leek and thyme for $28. As always, the mussels were perfectly cooked and seasoned. We were licking our fingers and lips and sucking those mussels out of their shells like there was no tomorrow. Mussel pots also come with a bowl of chips and homemade mayo. I love fatter chips so these were great with our meal. The mayo was so rich and creamy that I couldn’t eat too much of it in one go. It was one of the better mayos I’ve had in restaurants. You get a separate lid like pot to throw all the empty mussel shells in and the waiter will come around every so often to change it when it overflows. The mountains of shells always impress me. Look at that white wine sauce at the bottom of the pot! Yuye and I were scooping it up and drinking it like a soup. It was so buttery and rich it actually made me quite full. It doesn’t look too impressive from the front but boy the dish was huge! It was two whole pieces of pure meat. I thought I was going to fit in dessert afterwards but I was wrong. We came here again when I finally picked up the passports a few days later. It was like a celebration for finally getting the visas done. Celebrations can’t do without some form of alcohol, especially when the weather was great, so I decided to join Yuye by ordering a beer of my own. I don’t really like regular beers so a flavoured one was chosen. 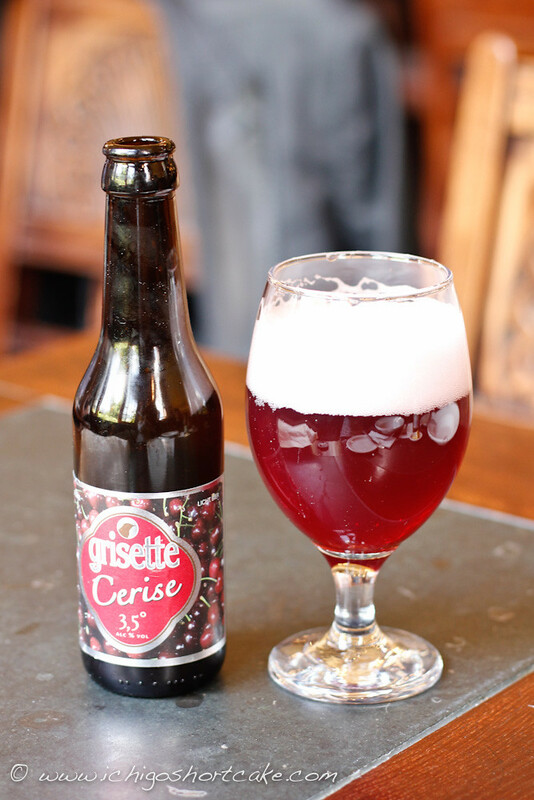 It was the Grisette Cerise for $9.50, a cherry flavoured beer that’s only 3.5 percent alcohol. It’s an imported beer from Belgium that is very sweet, refreshing and not that beer tasting. It was perfect for me since I don’t like beer, but avid beer lovers might not give this drink a thumbs up. I thought it looked very pretty too with the bright red colour and huge layer of white foam on top. Yuye felt like being a bit girly too and chose Monteith’s Crushed Pear Cider for $9. This one was not as sweet and stronger in alcohol, which I thought was more refreshing and nicer tasting. 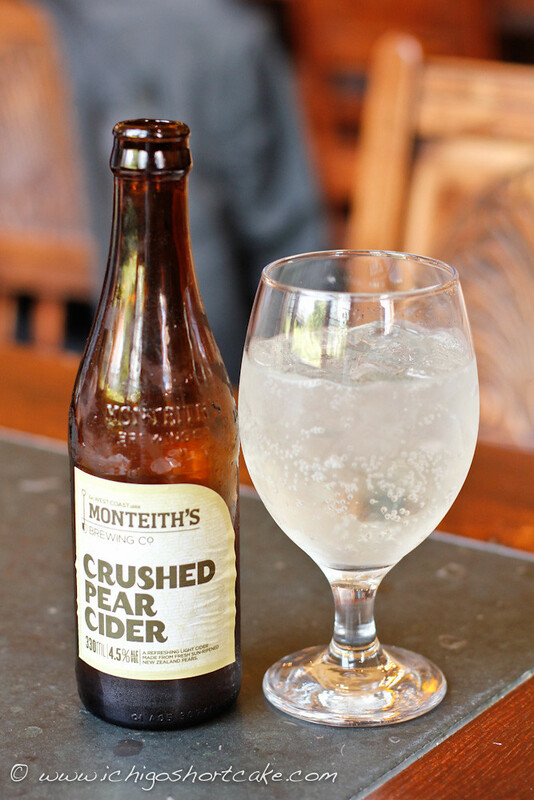 Monteith’s is an old brand from New Zealand and also includes the crushed apple cider and traditional beers. 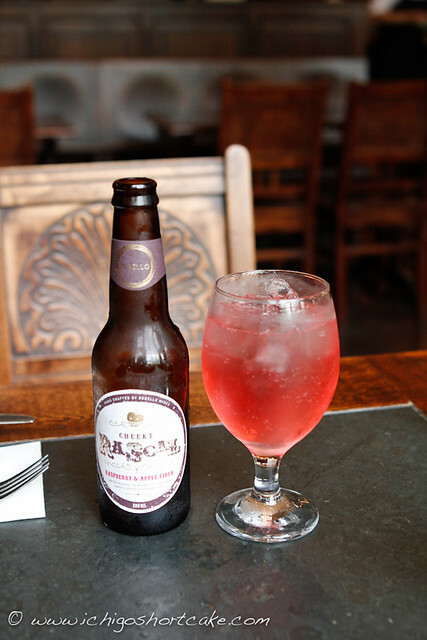 Their ciders are made from real fruit, not concentrate. This beverage is available from Dan Murphy’s if you fancy drinking it at home. 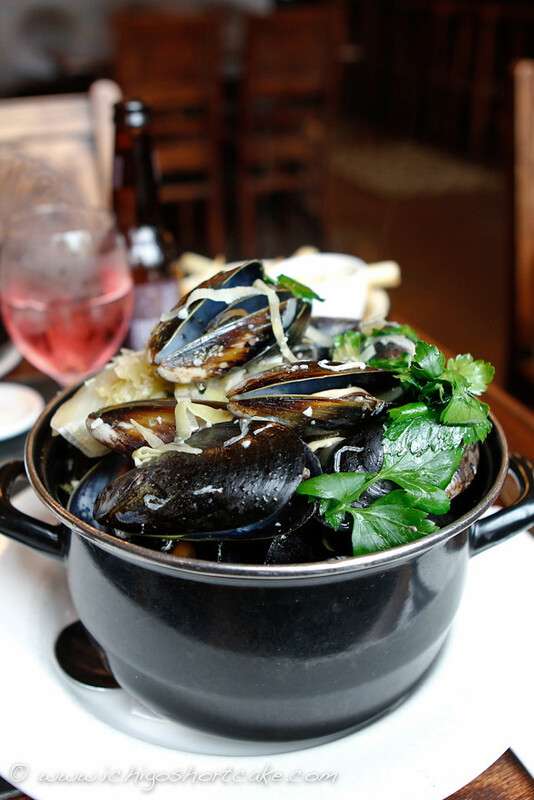 Yuye, not surprisingly again ordered a pot of mussels. This time it was the Espanol with chorizo, green olives, smoked paprika, tomato and red wine also for $28. It was so much more filling than the previous pot because of the chorizo and olives but we both agreed that the Mariniere was better. It was in no way bad, in fact it was quite delicious as I love tomato based dishes. The only flaw about this dish is that it had less sauce than the Mariniere so the mussels themselves were sometimes a bit bland. Eating the mussels with chorizos and olives helped but that made us very full. I wanted to be smart this time round and ‘order less’ so I could finally fit in dessert. I really wanted to try the waffles. Was I smart? Not at all. For some stupid reason I thought ordering three beer food dishes would be less than a main. It totally wasn’t. Regardless of this, I was still very satisfied with what I ordered since they were all very nice and I managed to taste many different dishes at once! The first dish was steak tartare or what’s called Fillet Americain for $14. It came with hand-cut raw steak tartare, croutons and horseradish cream. The first thing I noticed was the lack of egg yolk on top which was a disappointment. 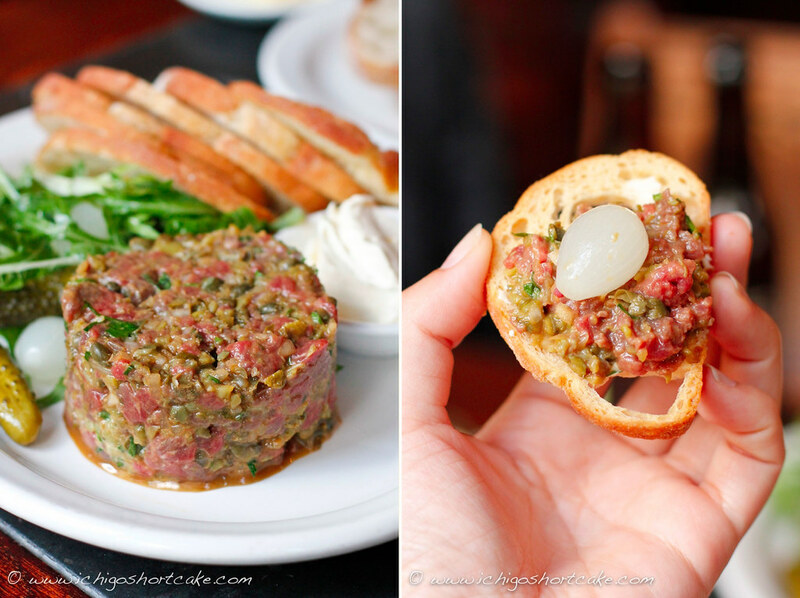 The second thing I noticed was the sheer amount of gherkins and capers mixed into the steak tartare. It was way too much and made it too sour. I think an egg yolk would have softened the sour taste and made it a lot nicer. I did like the pickled onions although I probably preferred to eat them by themselves. The croutons I believe were made from the same bread as the complimentary ones we got at the beginning of the meal. 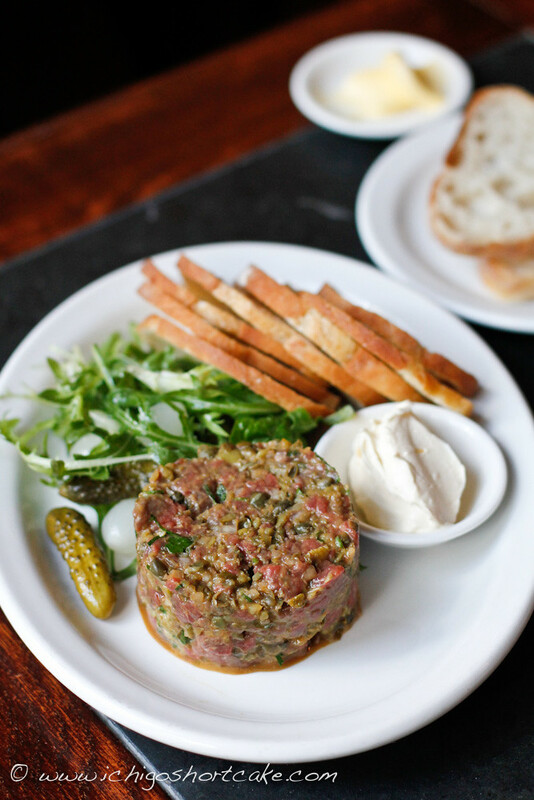 They were very crunchy and easy to pick up the steak tartare with. 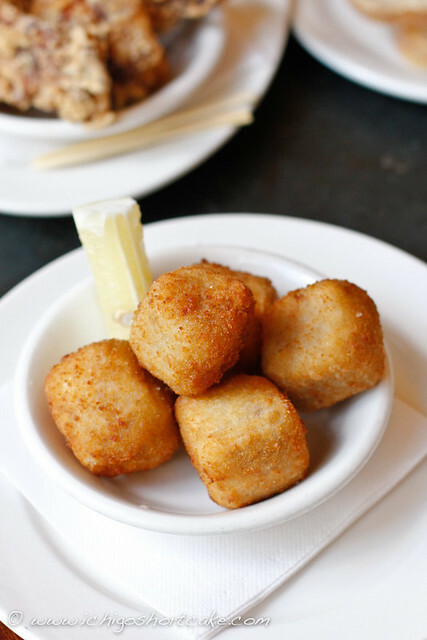 The croutons were also very filling, another reason why we shouldn’t have ordered this dish even though they were nice. 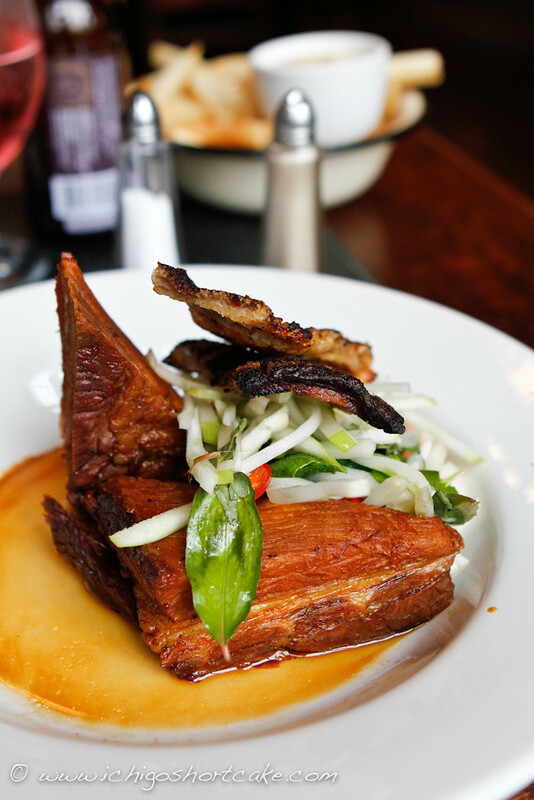 The second dish I ordered as recommended by the waiter was the crispy chicken ribs marinated in cider, honey and mustard for $9. It came with 4 pieces of fantastic chicken ribs that were heavenly to bite into. Yes it was a bit oily but hey, I wasn’t there to eat healthy! The batter was so crispy they crumbled as soon as I sank my teeth into them. 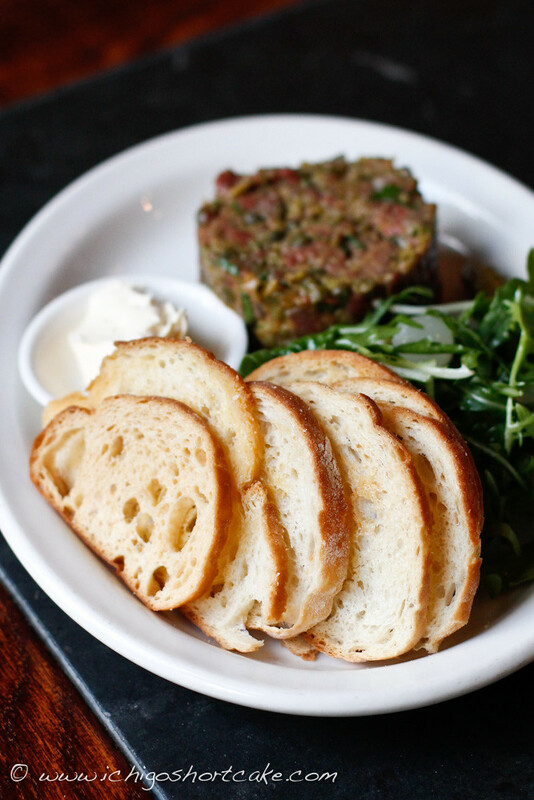 The meat inside was a perfect contrast of tenderness and juiciness that I could have eaten them all day. The ribs disappeared instantly. The sauce was nutty, almost like a satay sauce and went well with the chicken, although I preferred a bit of lemon on it to make it less oily (I used the lemon from the croquettes). The last dish of the day was the manchego cheese & smoked cod croquettes for $8.50. This came with 5 small cheesy fried balls that were tasty although a little bland. The lemon helped and so did the nutty sauce from my chicken ribs. 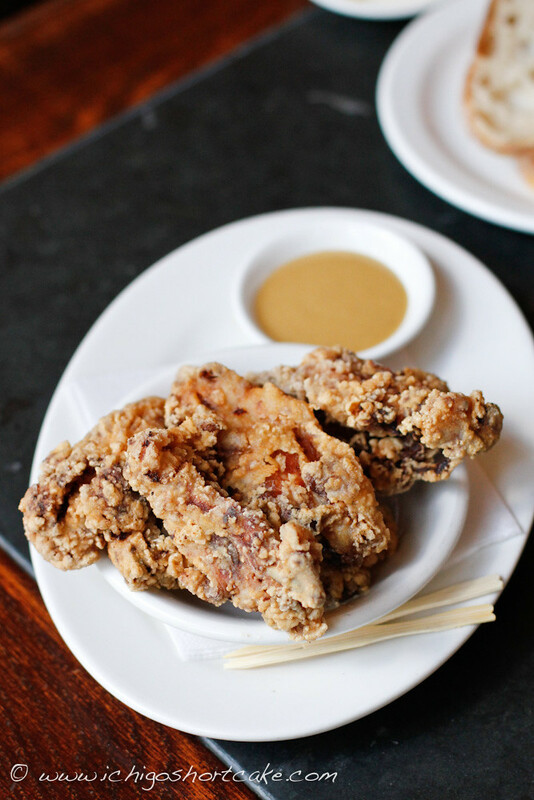 Maybe they should include the dipping sauce for this dish too to give it a bit more flavour. It was so creamy though that it was hard to finish, especially with so many other things to eat too. Again, I over ordered and I didn’t get to eat dessert. Unfortunately it is a difficult task when it comes to food, when should one stop ordering and eating? In order to fit in dessert, I have to be less than completely satisfied after my main. Oh the dilemmas. Question time: Can you normally fit in dessert after a main course or are you like me and constantly over order the savouries? 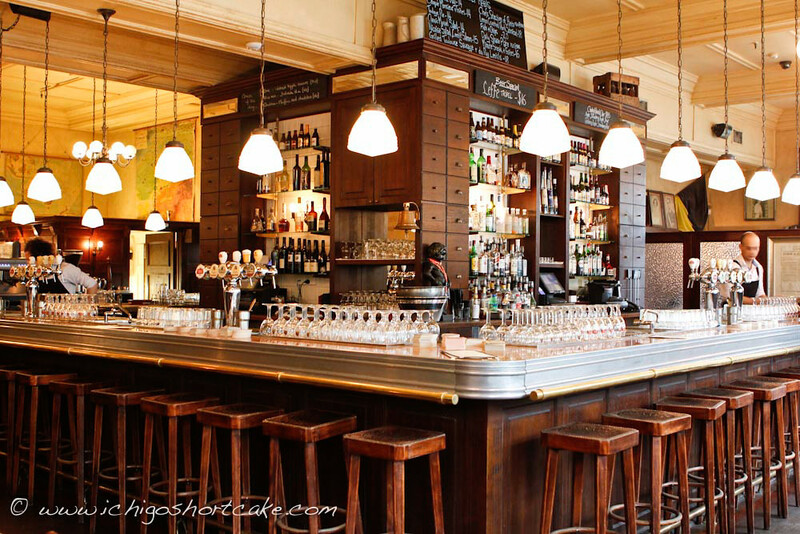 Belgian Beer Cafe is not the cheapest place for a beer or a meal but the great environment and good selection of drinks and food makes it worth the money. Since I go back to China every year, my next trip being March 2012, I will definitely be visiting the Belgian Beer Cafe Bluestone again. Next time, I hope my stomach can do the ordering rather than my eyes. 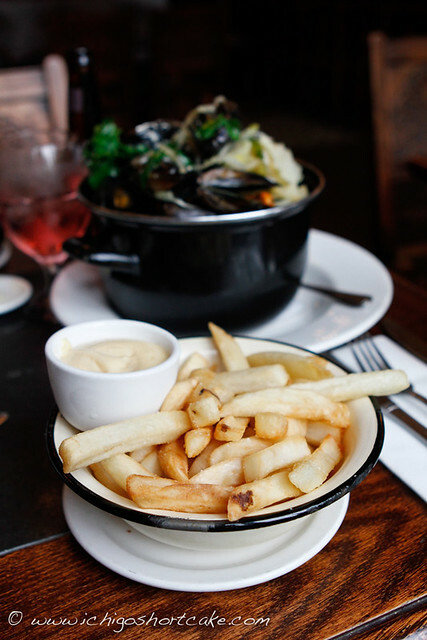 If you’re craving for some mussels but are not willing to go to St Kilda, there is also a Belgian Beer Cafe Eureka in Southbank which serve the same food and to similar standards. All those dishes look fantastic. It's 8.15 in the morning and now all I feel like finding is my nearest Belgium beer cafe! The two ciders you mentioned sound lovely, I'll have to look out for them. Everything looks really good-great photos there! And hehe yes I can imagine government departments require a special kind of patience. One that I don't have! Beer gardens are so much fun! I like fruit based beers as they are much sweeter and palatable to me! Oh man I'm so going here. I love a good cider. Monteith is a good one, as is gypsy. Your cherry beer sounds really interesting. 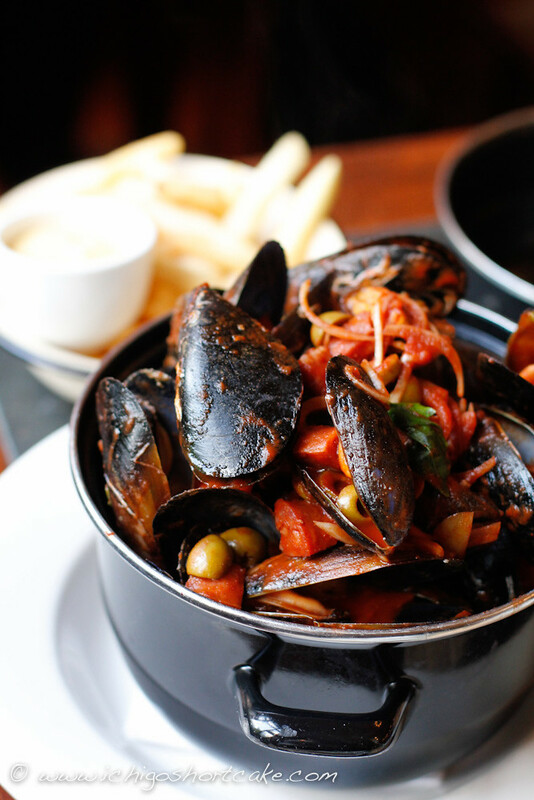 Those mussels look amazing! I'm so into mussels. And chicken ribs. They are quite underrated, I feel. @Ruth, thanks for your comment! 😀 I loved the cider and I also loved your strawberry farm! The strawberries were beautiful.